Dr. Orner has studied the mechanism of injury in over eight hundred cases. These cases have involved injuries from high and low speed automotive accidents, motorcycle and bicycle accidents, pedestrian accidents, aircraft crashes, industrial accidents, falls, electrical injury and electrocution, burns, and many other types of incidents. These Case Studies are based on actual cases and illustrate combined medical and engineering approaches addressing crucial elements, presented as simply as possible. The accident occurred at sunrise on a rainy day at an intersection on a deserted downtown street. Shortly before the accident, a nearby shop owner heard a man shouting and honking of horns. She looked out through her window and saw the decedent walking down the middle of the street and shouting at passing vehicles. The bus driver testified that she stopped at the traffic light and then turned right and "felt the rear of the bus lift up" when the rear of the bus was past the crosswalk. The pedestrian was pronounced dead at the scene. He was found face down outside the crosswalk with tire tracks running transversely across his upper back and tears to his pants pockets and belt suggestive of snagging on the undercarriage of the bus. Markings on the right rear (R/R) dual tires, mud flap, and air brake canister and a "smudge" on the side of the bus rearward of the rear doors suggested body contact. The autopsy showed "marked distortion of the skull [with] multiple fractures of all bones of the skull," but "no observable direct injuries" to the brain. The brainstem was transected (severed) at the level of the medulla. The multiple skull fractures without visible brain injury are evidence for crushing rather than impact trauma to the head. There were multiple rib fractures, all posterior. Both the left and right heart ventricles were massively ruptured (e.g., a 2" x 3" hole), but the aorta was intact. The liver and spleen were lacerated and there was a T8 thoracic vertebral fracture with an adjacent spinal cord transection. The pattern of these injuries (and non-injuries) to the thorax and abdomen is further evidence of crush rather than impact. There was a fracture of the right upper arm and minor abrasions on the knees, but otherwise no injury to the pelvis or lower extremities. Medically, it is clear that both the brainstem and heart injuries were immediately lethal. The pathology of death was not in dispute, but the mechanism of injury was. The plaintiffs' experts opined that the bus struck the fleeing pedestrian who fell and passed between the front tires and was then run over and killed by the R/R tires. From a combined medical and biomechanical engineering standpoint, the aggregation of injuries clearly indicates crushing trauma. There was no evidence of any significant impact force, which was at most a brush or push. The medical and biomechanical evidence shows that the bus ran over the victim's head, thorax, and upper abdomen. The biomechanical key to the actions of the pedestrian prior to being run over is the bus's low speed offtracking which causes its rear tires to follow a smaller turning radius than its front tires, and is the reason why long vehicles must swing wide on turns. 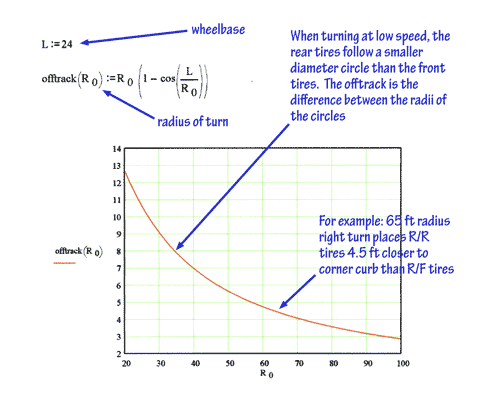 The 1st image shows the relation between the turning radius and the offtracking; the tighter the turn, the more the offtracking. If the pedestrian was initially positioned at the "smudge" as the bus turned, the offtracking calculation shows that the side of the bus moved about 2' to the right by the time the R/R tires ran over his body. 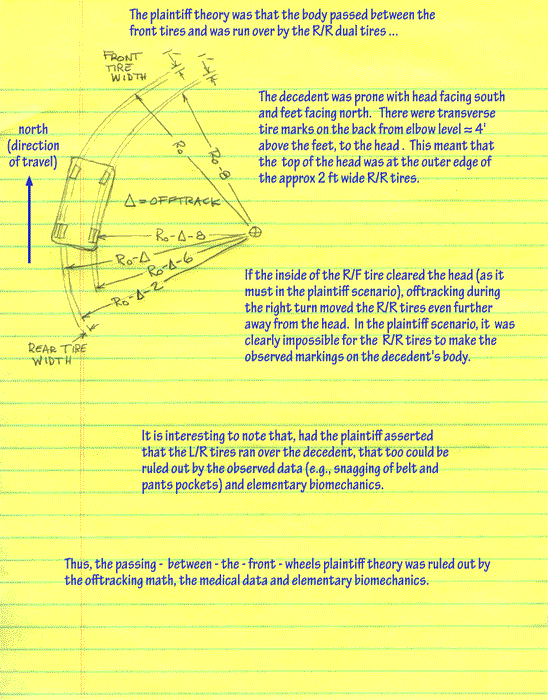 The 2nd image examines the plaintiff's theory. If the pedestrian's body passed between the front tires as the bus turned to the right, offtracking places the R/R tires even further to the right and thus they could not have run over the body. The 3rd image is a calculation based on the offtracking, autopsy findings, body rest position, and what was known about the positions of the bus and pedestrian at the "smudge" location. The calculation shows that the pedestrian travelled toward and under the right side of the bus at about 5 mph (same speed as slow jogging). The decedent could have been thrown under the bus, or he could have thrown himself under the bus. All that could be said at the time of trial was that, with reasonable certainty he did travel under the right side of the bus at about 5 mph. Epilogue: The jury returned a defense verdict. It is interesting to note that a certain police report surfaced too late to be seen by the jury. That report, which was previously unknown to the defense, documented a recent 72 hour involuntary psychiatric detention for suicide attempts by throwing himself in front of moving vehicles. Pass your mouse over the images below to see some of the calculations for this case. Click anywhere to close an image. An executive jet which was carrying a pilot, copilot and two passengers crashed, impacting a fence and then obliquely striking the wall of a building at a speed greater than 110 knots (126 mph) while uprooting and/or breaking several mature trees. The cockpit was sheared off upon impact with the building, ejecting the pilot and copilot. The pilot and copilot had skull fractures so severe that their brains were eviscerated (removed from the skull) by the violent crash. They obviously died instantly. The passengers remained in the aft section of the remaining fuselage until the side of the aft section impacted a tree and broke in half, ejected them, and came to rest. The passengers’ bodies were found next to each other on a paved parking lot, several feet from the fuselage remnant and near the apparent fire perimeter. According to the federal aviation investigators, the fire broke out shortly after the aircraft came to rest (and thus after passengers were ejected), consuming much of the aircraft and severely charring all four bodies. Autopsies indicated that the cause of death of all the occupants except passenger X was attributable to blunt force injuries including massive head trauma. Passenger X was reported to have died from thermal injuries (burns) and smoke inhalation. The question to be answered was whether passenger X was consciously aware of suffering thermal injuries before succumbing to them. The answer involves a straightforward but detailed biomechanical and medical analysis of the facts. Simple physics showed that the time between aircraft impact to the fence and the moment the passengers’ bodies came to rest was less than three seconds. The ejection process itself took less than one second. Since the fire started after the passengers were ejected, it is reasonably certain that passenger X was on the ground and immobilized for at least a few seconds before the fire arrived. The coroner reported that nearly 100% of passenger X's body was burned, including the tongue and epiglottis. There was soot in the posterior pharynx (back of the throat), upper airways and bronchi. The coroner did not find any potentially immobilizing injuries or fractures. The coroner found lacerations of the sigmoid colon and mesentery (membrane anchoring the colon to the abdominal cavity) and clear pink cerebrospinal fluid (CSF) in the ventricles (CSF-filled spaces) inside the brain. The coroner found passenger X’s carboxyhemoglobin (COHb) to be 25%. COHb measures the amount of carbon monoxide (CO) absorbed by the blood. The test was done because CO is the most ubiquitous toxic combustion byproduct. The normal values for COHb are: non-smokers ≈ 1-3%, smokers ≈ 3-13%. COHb = 25% would be expected to cause headache or shortness of breath with exertion, or inability to concentrate, but not immobilization. CO breathing has been studied with human volunteers who attained COHb ≈ 16% and were not harmed. The time to attain the maximum COHb is at least a few minutes. With only a few seconds of CO exposure at most, CO toxicity did not immobilize passenger X. The elevated COHb, burned epiglottis and soot in the airways indicates only that passenger X was inhaling fire combustion products. CSF is normally crystal-clear, colorless and free of blood cells. Pink CSF is caused by the breakdown of red blood cells. In this setting of impact trauma, the blood most likely came from a brain contusion associated with concussion. Loss of consciousness (LOC) from a concussion explains passenger X’s inability to move the few feet necessary to escape from the approaching fire. Passenger X most likely was seatbelted on the non-impacted side of the aft fuselage remnant at the final tree impact and thus was spared the violent direct impact injuries of the pilot, copilot and other passenger. The colonic and mesenteric lacerations are classic seat belt injuries, and together with the paucity of head and thoracic injuries, indicate that the seat belt initially restrained passenger X. The most likely explanation consistent with all the biomechanical and medical facts is that passenger X died from thermal injuries but suffered a head impact producing concussion with LOC which prevented an escape from the approaching fire. Passenger X was unconscious when the fire arrived. A healthy seatbelted young man was driving his Toyota 4x4 pickup truck and pulled up behind a semi-tractor at the entrance to the yard of a trucking depot. The semi-tractor backed up and its dual tires struck the front of the Toyota. The resulting Toyota "delta-v" (change in velocity) was about 8 - 10 mph rearwards. The young man went to an ER shortly after the accident complaining of thoracic and low back pain and was subsequently treated conservatively by an orthopedic surgeon. 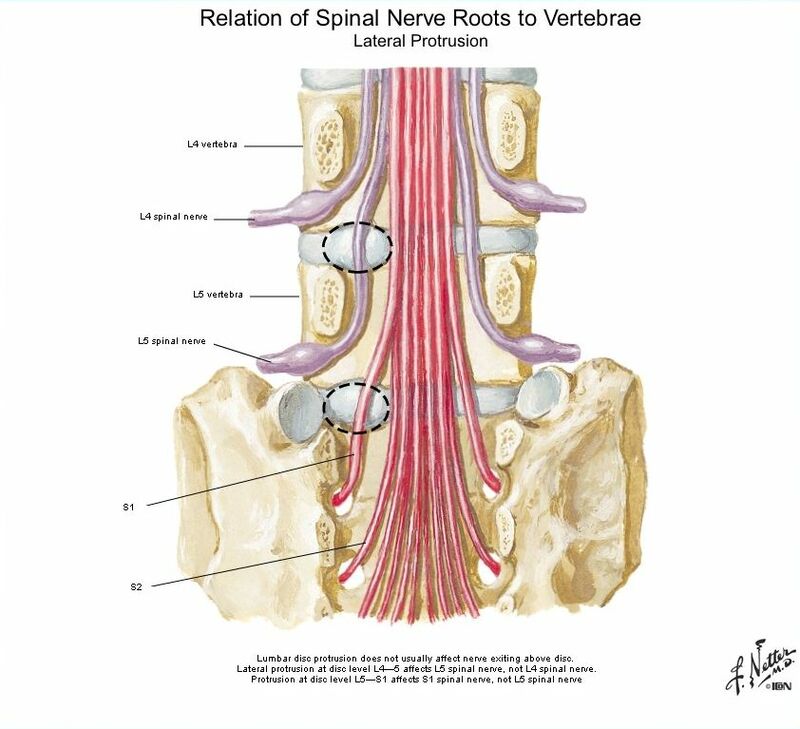 He developed radicular (spinal nerve root) symptoms with pain radiating down his right leg. 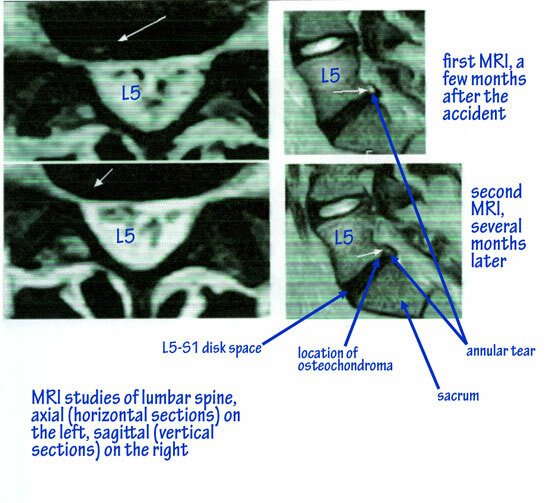 A lumbar spine MRI was performed a few months after the accident and showed severe L5-S1 foraminal narrowing (occlusion of the space through which the S1 nerve passes); a degenerative disk bulge; an area of hyperintensity (increased fluid content) suggestive of a recent tear of the L5-S1 annulus (the fibrous wrapping around the nucleus of the disk), and spondylosis (degenerative bony outgrowth) of the L5 vertebral body just above the disk bulge. Despite conservative treatment for several months, the symptoms continued. A repeat MRI showed resolution of the hyperintense area, but was otherwise unchanged. A CT scan was performed a couple of months later and showed that the "spondylosis" was actually a tumor growing into the spinal canal. The S1 spinal nerve was severely compressed by the combination of disk bulge and tumor occluding the space around it in the spinal canal. The actual MRI and CT images are shown below. Surgery was performed shortly thereafter, and revealed an osteochondroma (benign bony tumor) growing out of the right side of the inferior endplate (the bottom) of the L5 vertebral body immediately above the L5-S1 disk bulge. The S1 nerve was severely compressed and flattened. The plaintiff claimed that the frontal impact from the semi-tractor was responsible for his S1 nerve problem. The defense biomechanical injury causation theory essentially was that, based on numerous collision tests with human volunteers from the general population, the 8 mph frontal delta-v could not have caused the injury. It is biomechanically reasonable to assert that an 8 mph frontal delta-v would not be expected to create an annular tear and/or disk bulge in a normal healthy young person taken from the general population. Disk bulges and herniations are commonly seen on MRIs and CT scans of atraumatic, asymptomatic individuals. Thus, a disk bulge or herniation discovered on a CT or MRI taken after an accident without a "before" study certainly does not of itself implicate the accident as the cause. The orthopedic surgeon retained by the defense claimed that he routinely saw spinal osteochondromas just like the one in the subject case. Osteochondromas are indeed common non-malignant tumors of long bones in the legs and arms. 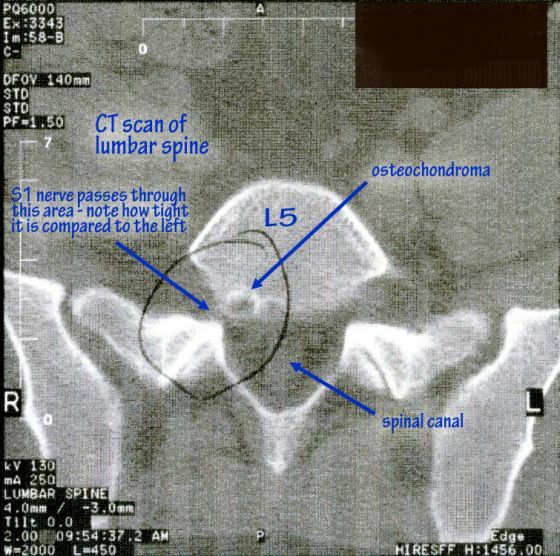 However, spinal intra-canal osteochondromas are very rare in the lumbar spine, and vanishingly rare at L5-S1. As of the time of the subject case (2001), only one had ever been reported at L5-S1. Whatever the retained orthopedic surgeon routinely saw, it is reasonably certain that he did not see L5–S1 intra-canal osteochondromas. The decrease over time of the annular tear intensity supports trauma to the young man's lower lumbar spine some months before the first MRI, independently of the probably preexisting degenerative disk bulge. A diligent search for another traumatic event besides the subject semi-tractor impact produced none. The L5-S1 osteochondroma clearly pre-loaded and flattened the S1 nerve, lowering the threshold for injury from further tension during lumbar flexion. The significant role the osteochondroma played in the causation of his S1 nerve injury made it clear that the injured young man did not belong to the statistical population on which the defense biomechanical engineering injury causation theory was based. Any valid biomechanical engineering injury causation theory must square with the medical reality of each case. In this case, the medical reality was objectively established, but the engineering theory failed to square with that reality. Pass your mouse over the images below to see some of the MRI and CT scan data for this case. Click anywhere to close an image. A middle-aged female with type 1 diabetes mellitus (DM) and a kidney transplant for diabetic nephropathy (DN) stepped on a piece of broken glass in her bathroom with her bare left foot. She was unaware of the event until she noticed swelling and “infection” some days later. She went to an urgent care clinic (UCC) where, over the course of the next two days the wound was débrided, cleansed and dressed, and she received IV antibiotics. She was then discharged with instructions to see her podiatrist who had previously amputated her left great toe when a “blister” became ulcerated. She claimed that the UCC personnel told her to use a heating pad on “low heat” on her left foot. She stated that she went home, set her heating pad to “low heat”, placed it on a pillow on her couch and laid down with her left heel resting on the heating pad. She did this “on and off” throughout that night and the next night. Each “on” period lasted less than an hour. She felt better the second day, but in the morning of the third day, she saw “a mass of blisters” on her left foot and immediately went to her podiatrist, who told her that the blisters were due to a burn from her heating pad. She developed ulceration, infection, and osteomyelitis (bone infection) in her left foot, and attributed all of that to the use of the heating pad. 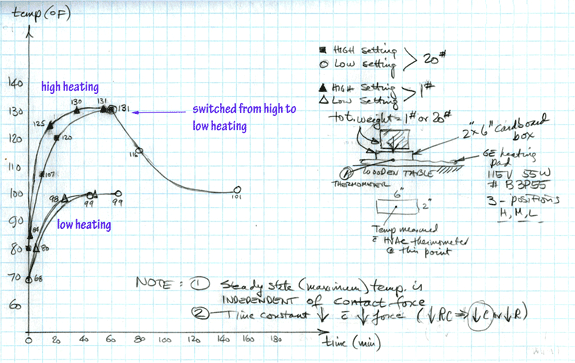 The biomechanical engineering and injury causation issues addressed were: (1) If she used the heating pad as alleged, could/did it cause a thermal injury? (2) If the heating pad did not burn her, what caused the blisters? (2) is a medical question and (1) is an injury biomechanics question and both must be answered. Diabetic peripheral neuropathy (DPN) is a ubiquitous complication of DM and commonly causes numbness in a “stocking and glove” distribution. It is a physiological factor in foot ulcerations. Further, since the diabetic patient cannot feel the pain, he/she often belatedly recognizes a puncture wound to his/her foot. The time history of the temperature rise under light and heavy pressure on the subject heating pad was measured for “low heat” and “high heat” settings. When set on “low heat,” a maximum temperature of less than 102°F was attained in about an hour. This was much less than the accepted 44°C (111°F) threshold for second degree cutaneous burns. What about the sudden appearance of blisters? Bullosis diabeticorum (BD) are bullae (blisters) which appear suddenly and look like, but are not burn blisters. BD is a rare complication of DM with uncertain etiology, more common in patients with diabetic peripheral neuropathy and DN. BD is not due to a burn, and unless there is an infection, it is benign and self-limited. The UCC personnel denied telling the patient to use a heating pad. In any event, the heating pad set on “low heat” could not and did not cause a second degree burn. The actual mechanism of injury here was the original infected penetrating wound (recall the delay to seeking care) in a patient with diabetes and diabetic peripheral neuropathy and the attendant proclivity to develop foot ulcers. Pass your mouse over the images below to see some of the thermal testing for this case. Click anywhere to close an image. A snowmobile driver was catapulted from his snowmobile when it struck an obstruction on an ice-covered trail, dug in, and flipped forward. The driver died at the scene from brain injury due to head trauma suffered when the shell of his helmet fractured on impact with an essentially flat area of the trail. Helmets are certified by a "drop test" from a certain height or to attain a certain velocity; the certified helmet is supposed to withstand the vertical velocity at impact and protect against serious brain injury. The biomechanical engineering question to be answered was: How did the helmet's actual vertical velocity at impact (or drop height) compare to the certification drop test velocity (or height)? 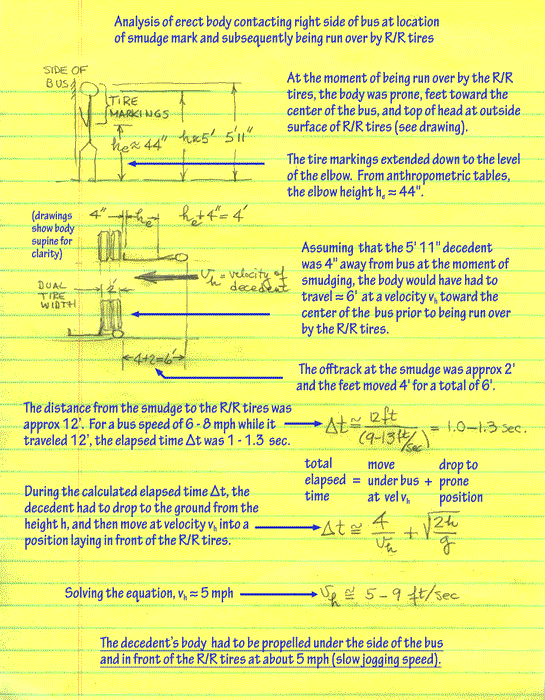 This required calculation of the height attained by the driver’s center of mass after he was catapulted. All that was known were the dimensions of the snowmobile and driver, the distance from the obstruction to the body and the approximate speed of the snowmobile. Straight-forward physics and worst-case assumptions were used to estimate the worst-case impact velocity. It was within a few percent of the certification velocity. 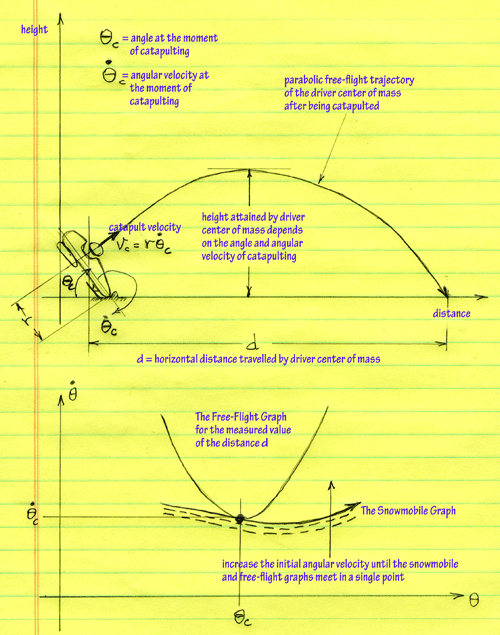 Elementary physics describes the angle and angular velocity attained by the snowmobile at the moment it catapulted the driver into parabolic free flight. The challenge was to calculate that angle and velocity and thus the parabola's height. The standard formulae of accident reconstruction didn't help here. 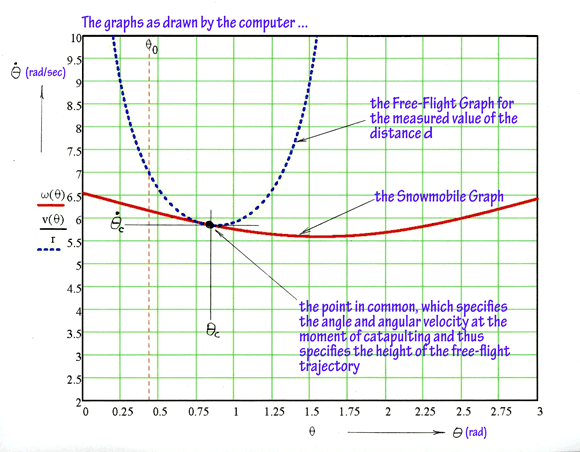 The straight-forward solution was to have the computer draw the graphs of velocity versus angle for both the snowmobile and the free flight parabola (on the same piece of paper, so to speak) and locate the single point where the two graphs met. 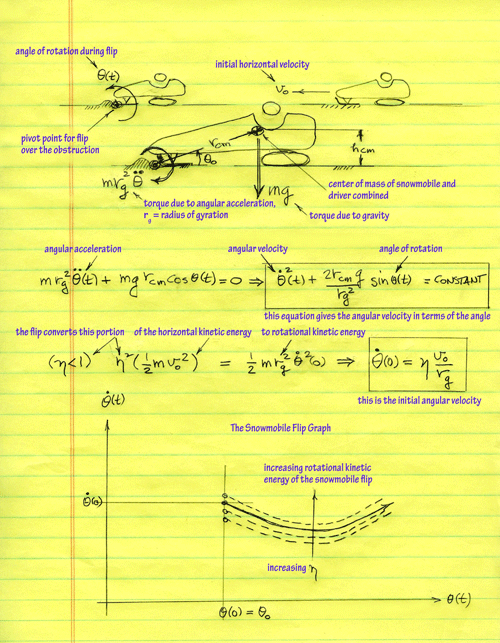 That point satisfied the physics of both snowmobile and free flight and specified a free flight drop height and vertical velocity at impact. The science demonstrated that the helmet failed from forces essentially the same as those of helmet certification testing. 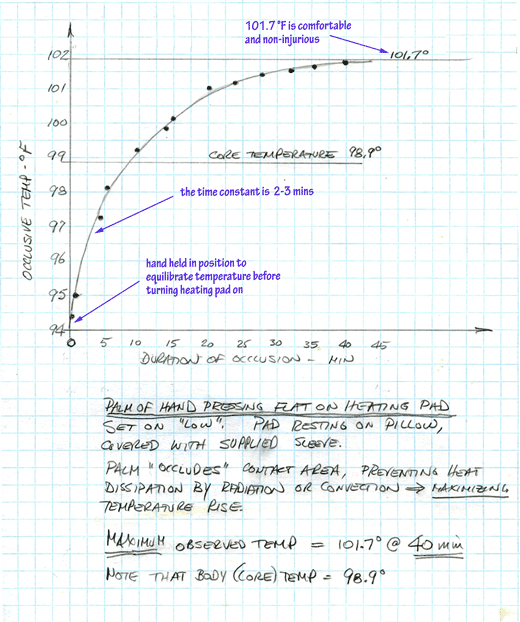 Pass your mouse over the images below to see some of the physics and mathematical calculations for this case. Click anywhere to close an image. Two young men were riding in a sports car with a T-bar roof. The sports car crossed the centerline and had a head-on collision with another vehicle at highway speed. The impact killed the other driver and one of the young men. The badly burned and charred body of the deceased young man was found inside the sports car which had been destroyed by the ensuing vehicle fire. It was alleged that the surviving young man, who was ejected through the open T-bar roof, was driving the sports car. The coroner's autopsy report stated that the deceased young man had severe crushing cardiothoracic injuries, an aortic transection (severed aorta), a complete brainstem transection (severed brainstem), and visible "patterned bruising" on the right side of his neck consistent with use of a shoulder harness. If the latter finding were true, the surviving young man was the driver. However, the biomechanical engineering analysis of the injuries of the deceased young man indicated crushing chest trauma and violent forward neck flexion strongly suggestive of steering wheel impact. Because of the severe cardiothoracic trauma and brainstem and aorta transections, the deceased young man suffered immediate loss of blood pressure (and life) upon impact. Ecchymosis (bruising) is caused by leakage of blood from traumatically damaged capillaries, and requires blood pressure to force the blood to flow and the time for it to accumulate in the surrounding tissue. In this case, there was neither the pressure nor the time. The surviving young man had severe fractures of both feet and lower legs, classically seen when a front seat occupant’s feet are planted on the floorboard in a frontal collision. Other than abrasions, he had no other significant injuries. The medical evidence indicated that the surviving young man was the passenger. Whatever the coroner saw, it was not bruising due to a shoulder harness. The autopsy evidence indicated that the deceased young man was the driver. A woman claimed that she slipped in a bathtub and fell, striking the tub and adjacent wall and toilet before coming to rest within the tub. She claimed that the trauma of the sequence of impacts and rebounds caused thoracic spine injury and brain injury. The woman gave a very detailed accounting of the sequence of impacts, describing in detail which surfaces she impacted with which parts of her anatomy. The biomechanical engineering analysis started with careful measurements of the incident site, with particular attention to the distances between the described impacts. The biomechanical engineering analysis showed that the described sequence of impacts was essentially impossible, i.e., the described incident violated the laws of physics. Analysis of the biomechanics of the described impacts showed that at least one of the impacts would have caused a facial fracture; but there were no fractures. The medical record revealed that the claimed thoracic spine symptoms and the radiologic findings in the thoracic spine did not match. The medical literature revealed that the particular claimed thoracic spine injury, multilevel thoracic disk herniations with neurological involvement, was extremely rare, i.e., extremely unlikely to actually occur. 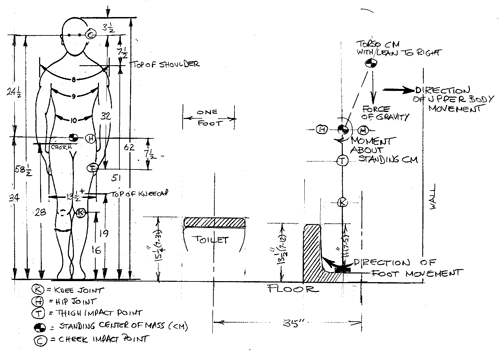 Pass your mouse over the images below to see some measurements and analysis for this case. Click anywhere to close an image. A worker was operating a pneumatic jackhammer to dig out wet earth at the bottom of a manhole when the tip of the jackhammer spade cut into a buried high voltage power line and shorted the power line to ground, creating an electrical arc which vaporized a portion of the spade and the power line. The man claimed that the electrical arc explosion blew him out of the manhole and that he suffered electrical injury due to electrical current passing through his body. The plasma pressure generated by an electrical arc in an electrical explosion has been studied and is well documented in the electrical engineering literature. 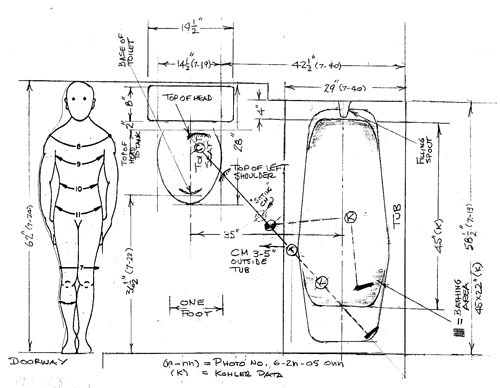 Given the dimensions of the manhole and the man's position and anthropometrical data (posture, height and weight), the biomechanical engineering analysis showed that the worker's described propulsion out of the hole by the subject electrical explosion was essentially impossible, i.e., the described incident violated the laws of physics. Eyewitness statements supported that conclusion. The shank of the jackhammer spade slid in a loosely fitting sleeve and was repetitively struck by a pneumatically driven piston. A significant metal-to-metal electrically conductive pathway from the tip of the spade to the handles of the jackhammer existed only during the brief intervals of repetitive contact of piston to spade shank, greatly increasing the resistance to electrical current flow over what it would be if there were sustained metal-to-metal contact. Physical analysis and dynamic testing of the resistance of the electrical pathway between the spade tip and the spade handles showed that the tip-to-handle pathway had a very much higher electrical resistance than the tip-to-ground short circuit in parallel with it. Adding to that the high resistance from the handle-through the human body-to-ground, virtually all the electrical current flowed through the very much lower electrical resistance short circuit to ground and there was no injurious electrical current flow through the worker's body. The medical records lack of evidence of electrical injury supported that conclusion. These Injury Topics are abridged summaries of issues relevant to a biomechanical injury causation analysis in a medicolegal setting. "Biomechanics" or "biomechanical engineering" as applied to the study of trauma to the human body combines the art, science and technology of several fields. The "bio" fields include human physiology (which in turn includes tissue properties, biochemistry, cell biology and metabolism, genetics, etc.) and clinical medicine. 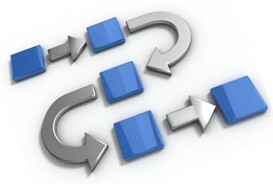 The "mechanics" fields include classical physics, applied mathematics, and the standard engineering specialties (e.g., mechanical, chemical and electrical). The simplified versions of math, science and medicine which appear in some medicolegal cases may or may not be good math or science, may or may not be valid, and may be incomplete, wrong and/or misleading. At the crux of this topic is whether or not the individual actually involved in a particular "low speed" motor vehicle accident did (didn't) or could (couldn't) suffer such an injury; and whether, with reasonable certainty, the usual and customary arguments are scientifically valid. For decades, physicians, biomechanical engineers, lawyers and others have debated whether low speed motor vehicle accidents can cause neck, back, and other "whiplash associated disorders" (WADs). The very existence of low speed motor vehicle accident (LS-MVA) causation of neck and back injury is controversial and the arguments can be confusing. The following is a summary of some current clinical and mechanistic issues relevant to the injury causation analysis of LS-MVAs. Mathematics and hard science differentiate the biomechanical engineer (without medical qualifications) from the physician (without engineering qualifications). The physician can generally speak to the physiological and medical aspects of injury without assuming anything about physics or mathematics, while the engineer can address the physics and mathematics, but not the medical aspects of the injury. At the crux of this topic is whether or not an individual actually involved in a particular "low speed" motor vehicle accident can suffer such an injury; and whether, with reasonable certainty, the usual and customary arguments are scientifically valid.